Fifth N' Sixth's Closet: Lady Danger..
Hope everyone is having a great week thus far! Nine west dress (old)//Boutique 9 shoes// Furla bag// D& G sunglasses//Moschino watch// Jewelry- Dubai, Saks and here// Lips- Mac Lady Danger. H&M blazer & pants// f21 top// DSW shoes// Purse & necklace- here// MK watch// Jewelry-Macys, Saks, & here//Ray-ban sunglasses// Lips-Mac Lady Danger. You ladies are rockin' it in floral print pants and colorblock heels! Loving the pants and the dress, you both are looking fabulous and flawless! Lovely dress, really like that pattern. you both look gorgeous! Like from a magazine ad! Hope you are having a wonderful day! Dying over those pants. Damn I wish h&m would open a store in New Orleans already!! I love that dress !! !an amazing combination of accessories .. I love your images ..
Loving these outfits! Such great prints!! Stunning look ! love the floral pants ! Hi Girls Thanks so much for your nice comment. Would love to follow, just joined yours now. Your style is amazing, the colours and patterns are stunning on you. And as for Lady Danger it's my all time favourite mac lippy and working for them for 15 years I've seen quite a few..
great this looks honey, i really love themm! Loved the dress and those H&M pants! 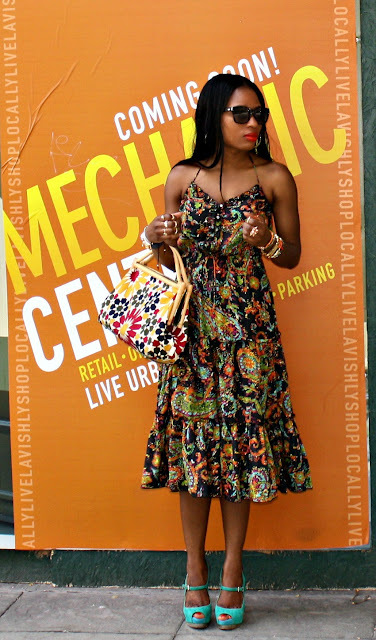 love both prints and the vibrant colors are gorgeous! love both shoes!! and the print for those outfits are lovely! Iwant the pink blazer and the floral print dress!! In love with that dress and tose pants! such an amazing color for blazer. You were beautiful in pictures. love your style, always so chic:)))))can I invite you to visit my first giveaway? both outfits I liked, but second is really awesome! I love how you're wearing these floral pieces! First of all, I love that dress Bisola is wearing! 9West clothing...I haven't seen it in stores in quite some time! Dammie's fierce suit is amazing! the floral pants and the heels!!! amazing!! Those are such cute outfits!! If you have time, would you please check out/comment/follow my blog? oh gosh. i love your styles! Hello, florals. I have been wanting some floral pants lately. They are too cool. thanks so much for visiting my blog! would love to follow each other ; ) following on GFC and bloglovin now. stay in touch! 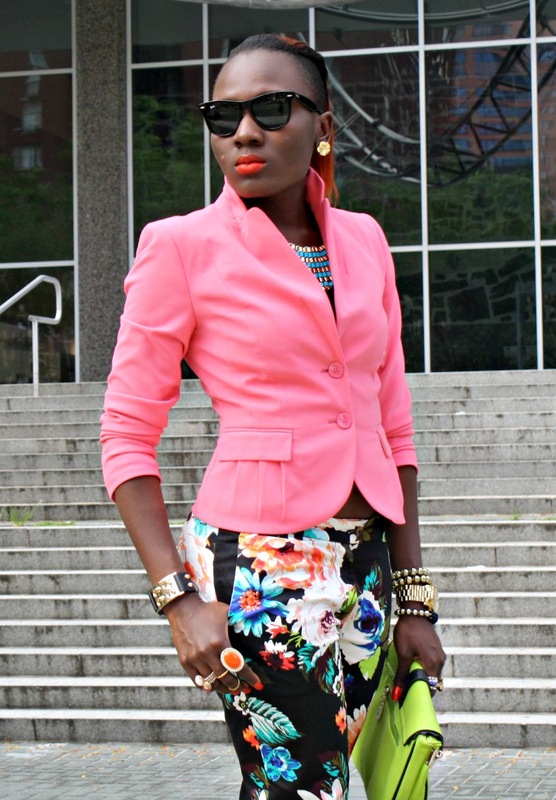 I absolutely adore the pink blazer, floral pants and whole outfit! 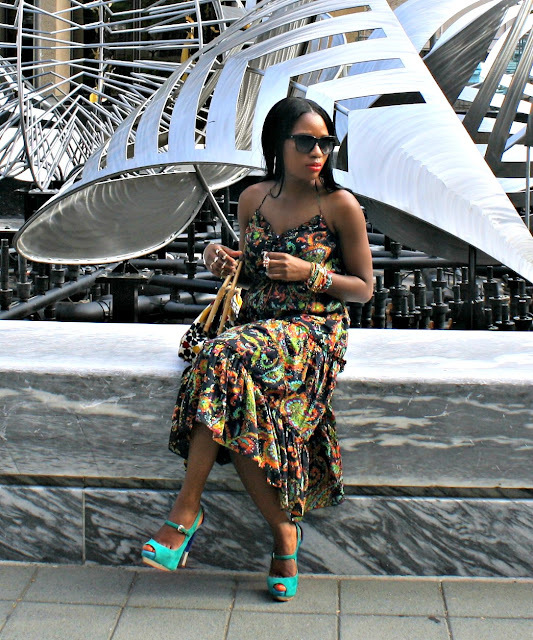 The dress is perfect for this sunny days. 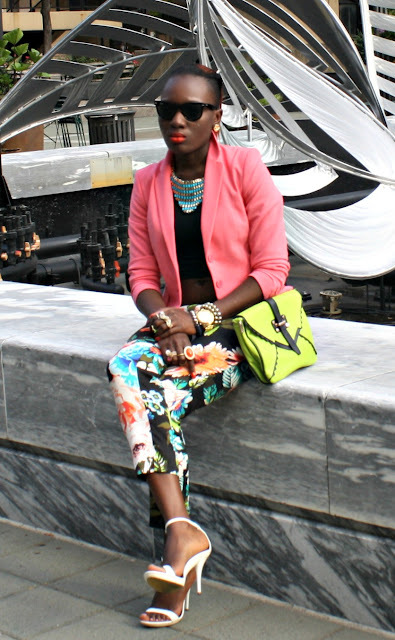 I like the mix of colors with the floral pants and the pink blazer. these outfits are SOOOO cute! I especially LOVE the dress! fabulous prints! in love with that pink jacket! These outfits are just perfect! My favourite is the one with the pink blazer, looks so fierce! Love the side cut !! Amazing outfits, you both have a great style. By the way what about to follow each other, let me know? Muahhh. WOW! !Love the floral pants and pink jacket combo! Loving the florals!!!!!! You ladies ROCK!!!!! Love the floral patterned pants! Your dress is so SUMMER!! Those H&M pants are so cute, love what you paired it with especially the shoes. Thanks for the comment on my blog.